Xilisoft Audio Maker Suite is packed with powerful and multifunctional audio tools for your audio-editing needs: Xilisoft DVD to Audio Converter and Xilisoft Audio Maker. Xilisoft Audio Converter extracts music from Home DVD and converts them into formats such as MP3, WAV, WMA, AAC, AC3, OGG, and M4A so you can play them anytime and anywhere. 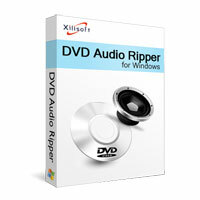 Xilisoft Audio Maker is packed with fantastic features like audio converter, home CD converter, and audio CD burner. Now your CDs music can be played in any popular music player! Xilisoft Audio Maker Suite works like a pro but is user-friendly to novices and first time users. You need not download complicated and expensive audio software to do the jobs, Xilisoft Audio Maker Suite will do it for you! Xilisoft Audio Maker is a multifunctional and easy audio converter, music CD Converter and audio CD burning application to convert between audio formats, convert CD to music files, and burn music CD from audios files easily and fast with excellent sound quality. Xilisoft DVD to Audio Converter is an outstanding DVD audio extractor and Converter which provides a fast way to convert home DVD to MP3, WAV, AAC, AC3, OGG, RA, WMA or SUN AU audio format easily and fast with excellent quality.